Goods and Services Tax (GST), a historic tax reform, will come into effect from tomorrow i.e.1st July, 2017. GST will completely transform the Indirect Taxation landscape in the country involving both the Central and State levies. In a departure from the normal practice, GST will be administered together by the Centre and States. To commemorate the historic occasion, a function will be held in the Central Hall of Parliament on the mid-night of 30th June - 1st July, 2017. The occasion will be graced by the Hon’ble President, Hon’ble Vice President, Hon’ble Prime Minister, Hon’ble Speaker of Lok Sabha and Hon’ble Union Finance Minister among other dignitaries. Why is GST so important? The biggest tax reform since independence - GST - will pave the way for realization of the goal of One Nation - One Tax - One Market. GST will benefit all the stakeholders namely industry, government and consumer. It will lower the cost of goods and services, give a boost to the economy and make the products and services globally competitive, giving a major boost to ‘Make in India’ initiative. Under the GST regime, exports will be zero-rated in entirety unlike the present system where refund of some of the taxes does not take place due to fragmented nature of indirect taxes between the Centre and the States. GST will make India a common market with common tax rates & procedures and remove economic barriers. GST is largely technology driven and will reduce the human interface to a great extent. GST is expected to improve ease of doing business in India. In majority of supplies of goods, the tax incidence approved by the GST Council is much lower than the present combined indirect tax rates levied [on account of central excise duty rates / embedded central excise duty rates / service tax post-clearance embedding, VAT rates or weighted average VAT rates, cascading of VAT over excise duty and tax incidence on account of CST, Octroi, Entry Tax, etc.] by the Centre and State(s). After the assent of the Hon’ble President on 8th September, 2016, the 101th Constitutional Amendment Act, 2016 came into existence. The GST Council was constituted on 15.9.2016. Since its formation in September, 2016 the GST Council has held 18 meetings. The Finance Ministers of all the States or their representative along with State and Central govt officials have participated in these extensive meetings and formulated the law and procedure to implement this historic tax reform. It was a mammoth task involving 27000+ man hours of intensive work. More than 200 meetings of the officers of the Centre and States took place in different parts of the country to expedite the implementation of GST. While framing GST Acts and Rules, enhanced ‘Ease of doing business’ for the taxpayers was a key consideration and accordingly the roles and responsibilities of the States and Central govt have been defined. In a short span of time, the GST council has cleared GST laws, GST Rules, Tax rate structure including Compensation Cess, Classification of goods and services into different rate slabs, exemptions, thresholds, structure for tax administration, etc. All the decisions of Council were taken with consensus. While formulating the Acts and Rules, extensive participatory consultations with trade and industry including other significant stakeholders were undertaken. Feedback was also obtained by posting draft Acts and Rules on the websites and inviting comments from the public. On 29th March, 2017, the Hon’ble Finance Minister of India tabled four Goods and Services Tax (GST) Bills for consideration and passage in the Lok Sabha namely The Central Goods and Services Tax (CGST) Bill, 2017, The Integrated Goods and Services Tax (IGST) Bill, 2017, The Union Territories Goods and Services Tax (UTGST) Bill, 2017 and the GST (Compensation to States) Bill, 2017. They were passed by the Lok Sabha on 29th March, 2017 and by the Rajya Sabha on 6th April, 2017. The threshold limit for exemption from levy of GST is Rs. 20 lakh for the States except for the Special Category, where it is Rs 10 Lakh. A four slab tax rate structure of 5%, 12%, 18% and 28% has been adopted for GST. A cess would be levied on certain goods such as luxury cars, aerated drinks, pan masala and tobacco products, over and above the GST rate of 28% for payment of compensation to the states. The threshold for availing the Composition scheme is Rs. 75 lakh except for special category States where it is Rs. 50 lakh and they are required to file quarterly returns only. Certain categories of manufacturers, service providers (except restaurants) are out of the Composition Scheme. GST envisages all transactions and processes to be done only through electronic mode, to achieve non-intrusive administration. This will minimise tax payers physical interaction with the tax officials. GST provides for the facility of auto-populated monthly returns and annual return. It also facilitates the taxpayers by prescribing grant of refund within 60 days, and provisional release of 90% refund to exporters within 7 days. Further facilitation measures include interest payment if refund is not sanctioned in time, and refund to be directly credited to bank accounts. Comprehensive transitional provisions for ensuring smooth transition of existing taxpayers to GST regime, credit for available stocks, etc. Other provisions include system of GST Compliance Rating, etc. Anti-profiteering provisions for protection of consumer rights. GSTN has been created as a section 25 private limited company with Strategic Control with the Government, to function as a common Pass-through portal for taxpayers. On this common portal, taxpayers will submit their registration applications, file returns, make tax payments, claim refunds etc. GSTN has been provided with a robust IT platform and it will provide interface to 80 lakh taxpayers and thousands of tax officials. All filings under GST will be done electronically. While GSTN remains a front-end, at the back end, the IT systems of CBEC and different states interface with the GSTN IT network to provide a seamless end to end processing of tax returns for the taxpayers. 64,000 officials have been trained on the GST portal from February till June 2017. The GSTN IT systems have undergone load tests, performance tests, vulnerability tests, security and all other mandatory tests. Enrolment of existing taxpayers of the State tax administrations and the Central Board of Excise and Customs to the GST system commenced on 8thNovember, 2016. More than 66 lakh taxpayers have activated their account at the GST portal. GST Application on Payment has been operationalized. 25 banks have been integrated with the GST Common portal and will be providing e-payment and Over the counter payment facilities as well as payment through NeFT/RTGS and credit/debit card. The Government has stepped up its outreach programme through various events, workshops, media, television to reach masses. Field formations of CBEC, at all levels have been activated to carry out interaction with the trade and industry to help them with the migration to GST and to clear their doubts. The field units of CBEC have run campaigns using mobile vans to reach the assessees at their door-step to help them with the GST migration and transitional issues. A total of 4700 workshops have been conducted across India. An extensive multi-media campaign through print and electronic media, outdoor hoardings, etc. has been carried out for informing, educating and assisting taxpayers and other stake-holders to enable a smooth transition to GST. Implementation of GST has necessitated reorganisation of the Central Board of Excise & Customs formations for administration of GST. The reorganisation involved bringing about structural changes and redeployment of human resources. Redeployment has been done to ensure outreach to the remotest corner. The Directorates which have significant role under the GST have been adequately expanded and strengthened. The field formations have been restructured as 21 CGST & CX Zones, 107 CGST & CX Commissionerates, 12 Sub-Commissionerates, 768 CGST & CX Divisions, 3969 CGST & CX Ranges, 48 Audit Commissionerates and 49 Appeal Commissionerates. For a smooth roll out of GST, it was imperative to carry out adequate capacity-building exercise and awareness. National Academy of Customs Indirect Taxes and Narcotics (NACIN) have conducted extensive training programs. In the first phase, nearly 52,000 officers were trained during September, 2016 to January, 2017 through a multi-layered training programme across India. A Refresher Training was also conducted on updated Law, Rules and Procedures and a total of 17,213 officials were trained till 23rd June, 2017. Under the Accredited GST Training Programme, 20 institutes have been certified as ‘Approved Training Partners’ to impart ‘quality training at reasonable cost’ to members of trade/industry and other stakeholders. 2,565 participants have been trained so far (ongoing). NACIN have also trained 2,611 officers from 92 Ministries/PSUs trained so far. Besides that, training resources such as 500 FAQs on GST have been released in English, Hindi and 10 regional languages. A number of Flyers on different topics of GST explaining the GST concepts, for dissemination to trade & industry, PPTs and Learning Videos for GST training and other training materials for the officials have also been released. A twitter seva started by the Government as an initiative to answer queries of the Tax Payers on a real time basis. The twitter handle askGST_GOI attracts thousands of taxpayer queries every day. A list of FAQs based on frequent questions asked on Twitter has been already got published. 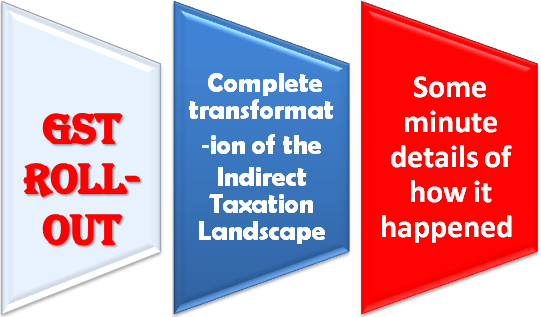 GST roll-out – Complete transformation of the Indirect Taxation Landscape; Some minute details of how it happened Goods and Services Tax (GST), a historic tax reform, will come into effect from tomorrow i.e.1st July, 2017. GST will completely transform the Indirect Taxation landscape in the country involving both the Central and State levies.